Hill and Wang, 9780374212452, 256pp. On a summer night in 1969, two men climbed down a ladder onto a sea of dust at the edge of an ancient dream. When Neil Armstrong and Buzz Aldrin first set foot on lunar soil, the moon ceased to be a place of mystery and myth. It became a destination. Now, on the fiftieth anniversary of that journey, Moonbound tells the monumental story of the moon and the men who went there first. With vibrant images and meticulous attention to detail, Jonathan Fetter-Vorm conjures the long history of the visionaries, stargazers, builders, and adventurers who sent Apollo 11 on its legendary voyage. 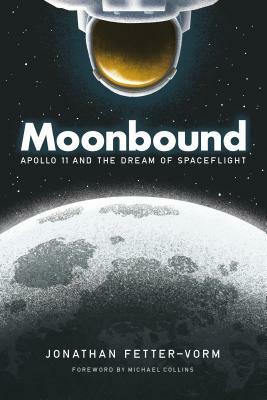 From the wisdom of the Babylonians to the intrigues of the Cold War, from the otherworldly discoveries of Galileo to the dark legacy of Nazi atrocities, from the exhilarating trajectories of astronauts—recounted in their own words—to the unsung brilliance of engineers working behind the scenes, Moonbound captures the grand arc of the Space Age in a graphic history of unprecedented scope and profound lyricism. Jonathan Fetter-Vorm is an author and illustrator. His Trinity: A Graphic History of the First Atomic Bomb was selected by the American Library Association as a Best Graphic Novel for Teens in 2013. He lives in Brooklyn, New York. Astronaut Michael Collins is one of 24 people who have flown to the moon. He flew in both the Gemini 10 space mission in 1966 and Apollo 11 lunar mission in 1969. He currently lives in South Florida.